Heavy Industries Taxila Education City (HITEC) University is located at the foothills of Margalla, about 30 km northwest of Islamabad. It has an integrated and purpose-specific complex, housing, educational institutes, and catering for pre-school to university education. The University is governed by Heavy Industries Taxila Education Welfare Trust (HITEWT). The University has dynamic, industrious, and highly committed full time faculty which keeps abreast with the latest developments in teaching methodologies. In a short span of time, HITEC University has emerged as a modern place of learning and can be rightly called a citadel of knowledge. The University is also actively involved in developing research and academic collaborations with foreign universities of repute. In 2013, two Memorandum of Understanding (MOUs) have been signed with Strathclyde University, Glasgow, UK and Istanbul Technical University, Turkey. HITEC’s ultimate aim is that its alumni should be readily accepted for industrial jobs based on their professional excellence and their quest for knowledge. The university’s website is www.hitecuni.edu.pk. HITEC University considers civic engagement as a valuable choice for students, staff members, and departments to work for the community. HITEC encourages students to increase civic participation by volunteering, campaigning, or even discussing community issues with other students while using University as an open public forum. Goals on civic engagement at HITEC include enhancing and promoting social responsibility and philanthropic work to positively impact society, also by focusing on education and research to enable students to become better citizens. Below are some activities of civic engagement at HITEC University. 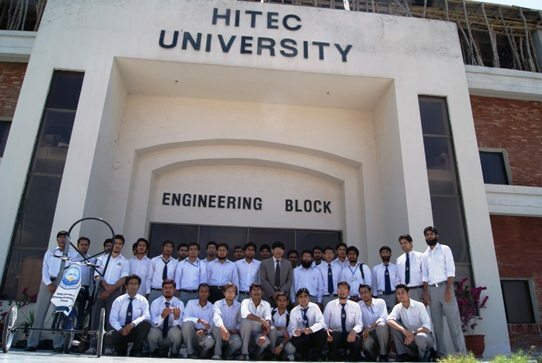 HITEC University allocates a substantial amount of financial assistance every semester for students. This assistance is provided on a needs and merit basis. During the fiscal year 2012-2013, 9.3 million Rupees (approximately 155,000 U.S. dollars) have been distributed among deserving candidates. The September 2013 earthquake in the Balochistan Province was a big natural disaster in Pakistan, in which about 1,000 people were killed and hundreds more were injured and made homeless. HITEC University immediately responded. One day salary of all the senior and junior staff, as well as faculty members, was dedicated to the earthquake victims. Students and staff of the University have been playing an active role in rehabilitating people in case of natural calamities such as earthquake and floods. A blood donor club is led by HITEC University students. The club held blood donation drives featuring students, faculty, and staff members to encourage students to meet their social responsibility as citizens and to be active participants in extracurricular activities. HITEC University students participated in different environmental activities like the Green Idea Challenge, to get an opportunity to think and act green in order to positively respond to the environment by using alternate energy resources, energy efficient systems and recycled products. University administration is also engaged in tree plantation drives involving staff and faculty members, to create awareness of environmental sustainability and benefits.